With summer upon us, you’re likely in the middle of the war on flies around your barn. Whether they are looking for a bloodmeal or just to be an annoyance, these persistent insects always seem to manage to find your horse. When developing a plan to manage these pesky critters, it’s important to know what species you’re battling. Behavior and breeding sites are specific to each fly species, and control tactics should be focused on the specific pest at your facility. House flies (Musca domestica) are usually the most common flies around a stable, and the toughest to repel. They are often found feeding on facial secretions, wet feed and manure. They’re also found around sheaths of horses and can be very annoying in high numbers. They have sucking-type mouthparts that can feed on both liquids and solid foodstuffs and are most active during the day. In order to “eat” the solid foodstuffs, the house fly vomits on it and its saliva and digestive fluids liquefy the particles, so that it can be sucked up during feeding. This behavior has implicated the house fly in the transmission of several pathogens to both humans and animals, alike. Female house flies lay eggs and the larvae can develop in a variety of places, including decaying organic matter, manure, carrion, garbage, etc. Control measures for the house fly include proper manure management, the elimination of larval breeding sites, and the use of multiple fly control products such as feed-thrus, on-animal sprays, scatter baits, and non-insecticidal traps. Face flies (Musca autumnalis) are closely related to house flies and very difficult to distinguish from one another in the field. They are a non-biting fly that feeds on facial secretions of animals and are responsible for the transmission of pathogens such as pinkeye in cattle. Adult female face flies are typically found around the horse’s eyes, mouth and muzzle, causing immense annoyance. The females lay eggs exclusively in fresh cow manure. Their larvae will not develop in horse manure, but it’s important to note that face flies can travel up to several miles. Control tactics include fly masks and on-animal fly sprays, such as Ambush Insecticide & Repellent, that can be applied to the face and head to kill or repel face flies coming to horses for a food source. Stable flies (Stomoxys calcitrans) are blood-feeding flies that are often found feeding on the legs of horses. They have piercing, sucking-type mouthparts that inflict a rather painful bite and are responsible for pathogen transmission of causative agents of equine infectious anemia and anaplasmosis. Stable flies are responsible for your horse’s kicking and stomping, which happens when he’s being fed upon. Eggs are laid in decaying organic matter, like wet straw or spilled feed, and aged manure. Control measures for stable flies include proper manure management and elimination of decaying organic material. Frequent mowing around barns can minimize resting areas that stable flies use to digest blood meals between feedings. However, care should be taken not to leave piles of grass clippings; when they start to decompose, they turn into a prime larval development habitat. On-animal fly sprays can be used for repellency (be sure to spray the horse’s legs and belly well!) and residual premise sprays can be applied to shady sides of barns where stable flies may rest. 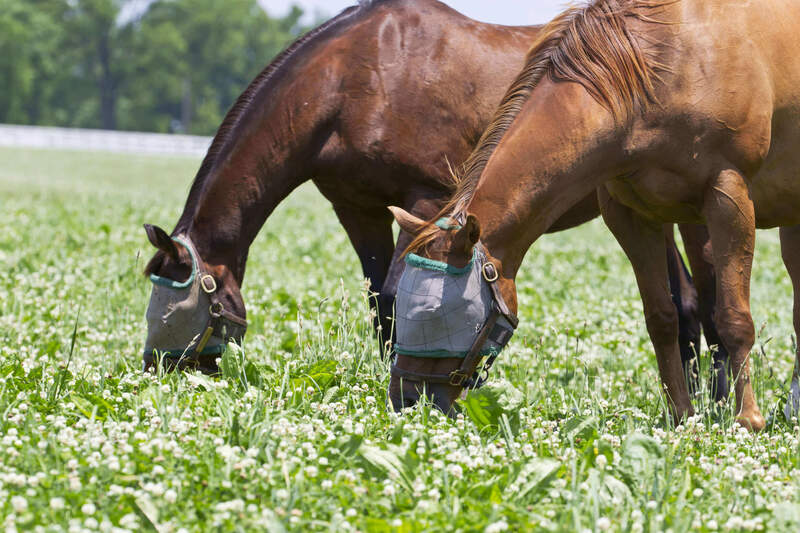 Feed-thru products are also effective against stable flies by preventing their development into mature adults in the manure of treated horses. Horse and deer flies are all grouped into the family Tabanidae. Horse and deer flies are easily identified by their larger size and the fact that all species in this family have large eyes which they use to locate hosts. Females are daytime blood feeders; they have knifelike mouthparts, inflicting an extremely painful bite and leaving bloody feeding sites on a horse. Males mostly feed on pollen or nectar for an energy source. Eggs are laid on vegetation around water and larvae are often aquatic or semiaquatic. Because horse and deer flies only land on horses for a brief time to feed, they can be difficult to control. On-animal fly sprays can be somewhat effective for repelling and killing horse and deer flies, but reapplication is frequently needed. There are many commercially available traps that can trap horse and deer flies to aid in reducing a population; however, complete elimination of a population is difficult. Horn flies (Haematobia irritans) are small flies that are primarily a pest of pastured cattle, but are also found around horses, sheep and goats. You’ll find horn flies on the backs, shoulders and sides of the animal. Both male and female horn flies have piercing mouthparts and feed on blood, taking up to 40 bloodmeals per day. Due to this feeding behavior they remain on the host animal day and night, leaving only to avoid fly-fighting behaviors by the animal or to lay eggs. Eggs are laid in fresh, undisturbed cattle manure where larvae will develop into the next generation of adults. When adults emerge, they seek a host, and often find horses or other non-bovine species to feed upon. Horn flies will not be able to maintain a population by laying eggs in horse manure; however, horn flies readily blood-feed from horses. Horn flies can be controlled by using insecticidal sprays that are labeled for horses. To be most effective, horn fly management practices must be employed in neighboring cattle herds as well. Mosquitoes are small insects with long, thin bodies and a long, sharp sucking mouthpart. Like the horse and deer fly, the females are blood feeders and the males feed on nectar or pollen. Depending on the species, female mosquitoes will lay eggs on the surface of standing water or in areas that are prone to flooding. There are certain species that prefer “cleaner” water, such as water troughs, while others thrive in stagnant water that is more “polluted.” There are some coastal species that even prefer brackish or saltwater. Mosquitoes are a concern for horse owners as they are vectors of eastern equine encephalitis, western equine encephalitis and West Nile virus. Efforts should be made to eliminate all standing water around barns that mosquitoes can use to lay eggs in. Horse waterers should be dumped and cleaned out every few days to interrupt larval mosquito development. On-animal fly sprays can be used to repel and kill adults feeding on horses in pastures, while insecticide barn misting systems can be effective in protecting horses inside. There are also various insect growth regulators and biological control products that can be placed in standing water to attack and kill mosquito larvae. Biting midges (family: Ceratapagonidae), often referred to as sand flies, punkies or no-see-ums, comprise a group of small blood-feeding flies that can be present in populations of thousands per animal. They are found most actively feeding at the hours around dawn and dusk. Eggs are laid in moist areas around ponds, marshes or stock tanks, as the larvae are semi-aquatic and will develop in the muddy areas. 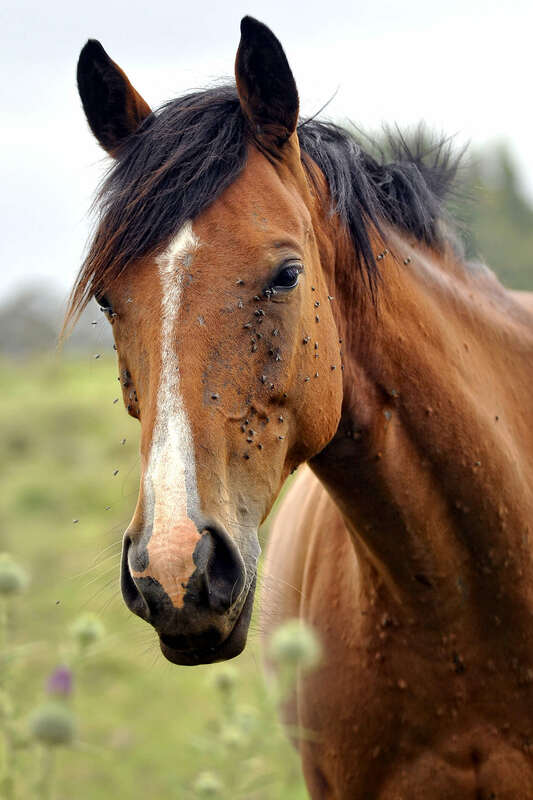 In horses, the biting midge (Culicoides genus) has been known to cause “sweet itch,” a hypersensitivity to the saliva in the insect bite, which is a type of chronic and seasonal skin irritation. Control measures for biting midges are limited to on-animal fly products to kill or repel them from feeding and eliminating breeding habitats where possible. When adult flies of any species are present, there are likely tens of thousands in their immature stages developing into the next generation. When planning a control program, there is no silver bullet. It is important to incorporate an Integrated Pest Management (IPM) program that includes sanitation, population monitoring, biological, and chemical control methods. As always be sure to read and follow label instructions carefully when using any pesticide. Ambush is a trademark of Farnam Companies, Inc.